Creating a new play can be a challenging process for any number of reasons. 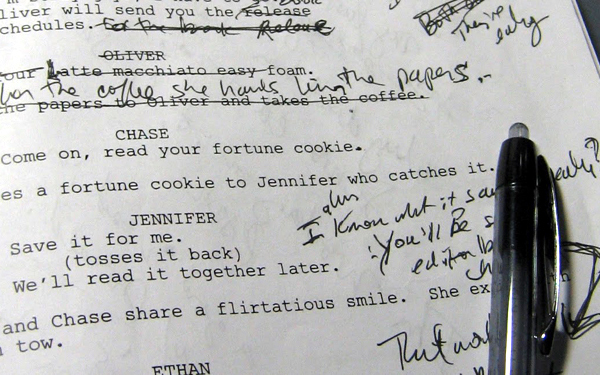 The first and most fundamental challenge revolves around shaping the script to tell the story that you want to tell. In my experience there are three key issues that can quickly derail this process - when a writer refuses to do any rewrites, when the writer is constantly rewriting, when the writer and the director are not on the same page with regard to what the story is or where it should go. With the first of these, there can several valid reasons why a writer may be opposed to doing rewrites. They may have had experiences where someone bullied them into making changes that they didn't agree with or where listening to someone's feedback just made the script worse. They may not know how to fix what they don’t like about what they've written and so it's easier to pass off "making it work" to someone else. They may not have objectively investigated if what's on the page is actually telling the story they think it is. They may just believe what they've written is perfect. (This is NOT to imply that writers are arrogant. It is merely to acknowledge that some people - writers, directors, zookeepers, etc. - are arrogant and believe they can do no wrong.) Regardless, of why they are opposed to doing rewrites, I think the best results happen when the development of a new play is thought of as a collaborative process, where various interpretations, qualities, and insights may be discovered. If you've assembled a team that really works well together, the combined brain power of the group can yield ideas that greatly enhance the final product. The other extreme, where the writer is making rewrites all over the place, can be equally frustrating. Again, this can happen for any number of reasons. There maybe an avalanche of chaotic feedback coming at them from the actors, designers, and director. There maybe seasoned industry people telling the writer the show can be a huge commercial success IF certain changes are made to the script. They may terrified that nothing they've written is working and trying to fix it by spraying "rewrite bullets" at anything that blinks. Writing a play is hard. Having it be put through the gauntlet of a reading or a production is even harder. If you're erring to this side of things, it can be particularly helpful to clarify for yourself what story you want to be telling. What are the basic plot points? What is the journey? What are the important relationships? What is the world like? If you have a clear understanding of what you want these elements to be, it will help you sort through the responses that you get. A note about feedback: some degree of feedback will find you regardless of whether you are seeking it or not. It may be vague (seeing or hearing the audience laugh or cry) or specific (overhearing a pointed comment as the audience leaves the theater). My feeling is, since you're bound to get some degree of feedback anyway, why not actively participate in the interest of filtering that feedback towards the things that you want to know. (What happened in this play? How would you describe this character? What relationships seemed to be the strongest?) If you ask specific but open-ended questions you stand a better chance of being able to figure out whether you've written what you wanted to write. Sometimes when you've got your nose buried in the keyboard, it's hard to accurately tell what you've got. The things that are apparent to you may not be apparent to everyone else. If you find out what you think you wrote is not actually what’s being received, you may want to do some rewrites. Remember that one audience member's comment (good or bad) does not necessarily represent the experience of the entire audience. They remain just one person. As with any data set, before you draw conclusions (and make any changes) you want to collect a decent sample size. Likewise, the person who "loved everything about it" and the person who "hated everything about it" are statistic anomalies - their response are too far outside of the mean to be useful. Perhaps most importantly, the writer and the director need to be on the same page with regard to what they hope to accomplish. Their agendas don't have to be identical, but they need to agree on the things that are most important. At the very least, they should agree on what story they are trying to tell. The same set of words and events can be interpreted in a variety of different ways. King Lear could be the story of how a man's favoritism ultimately destroys his family. Or it could be the story of one daughter's unconditional love. Or it could be the story of how unchecked jealousy destroys everything in its path. It's the same text and events, but leading to three different takeways. Once your play is published and out in the world for everyone to produce, you will likely need to come to terms with no longer being able to dictate how it takes shape. But in the stages leading up to that point, you have to be able to communicate to your director what this version is about. Ideally this would be the very first conversation you and your director have about the piece - hopefully while you're both still sussing out whether to move forward with the partnership. If the writer feels comfortable with the director, it then becomes the director's responsibility to decide whether writer's vision for the piece is one that they can be completely on board with. When the writer and the director can function as a united leadership team, it facilitates a clear and cohesive process for everyone else. One where the conversations in rehearsal are geared toward sharpening and clarifying the important elements. And where the choices that move forward with regard to performance and design continue to build on what was discovered in rehearsal. But in order for that to happen, the director has to have that in mind from the outset and writer has to continue to be available throughout the process. The play is the point from which everything else springs. Find what true north means for this story. There will things that feel like they are pulling you off course. That is what happens when you leave the safety of the shore to embark on a voyage. Keep that as your reference point and make your adjustments according. Trust in the crew that you've assembled to get you safely to your destination. Godspeed.